While the exploratory talks “won’t be over in a week”, the FT quoted a source who said the protracted negotiations over a deal that would create the eurozone’s second-largest lender after BNP Paribas, with €1.9tn in joined assets and more than 140,000 employees. In a note to employees published, Deutsche Bank chief executive Christian Sewing said: “we will only pursue options that make economic sense”. Sewing also said executives have a responsibility to consider options like possible mergers. He asked employees to stay focused on clients, adding that no deal is certain. “Experience has shown that there may be a lot of potential economic and technical factors that could hinder or prevent such a step,” Sewing said in his note. Yet while investors will likely cheer a tie up between Germany's two biggest banks, the labor unions are hardly excited. The German service sector union Verdi, which opposes the deal, expects that in a worst-case scenario, up to 30,000 jobs would be cut. “I think that’s a realistic number,” a senior manager at one of the banks told the FT, adding that he saw no outlook where unions would back the transaction. 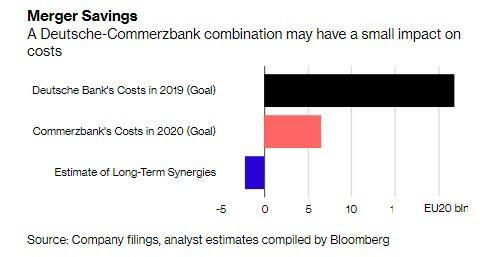 Yet while the banks' workers will suffer thousands of synergies, the advising investment banks are already counting their year-end bonuses: until recently, Commerzbank had engaged bankers but they told peers no deal was actively being negotiated. The tone of that message changed in the past week, suggesting talks were on and details being hammered out, according to people close to the Frankfurt-based banks. The German finance ministry has signaled to the banks that it supports a deal and in fact stands ready to support tens of thousands of job cuts the banks say are necessary for a deal to make economic sense, according to an official close to Finance Minister Olaf Scholz. 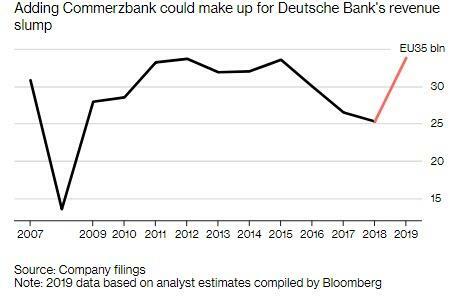 Still, the massive jobs losses could quickly escalate into yet another political scandal for Germany's government: Commerzbank is 15% owned by the German government following its bailout during the 2008 financial crisis. Since 2016, it has cut staff and narrowed its focus to deposit-taking and commercial lending. It has boosted its customer base and loan volumes to the prized German midsize companies. However, the bank continues to struggle in a highly competitive German market, home to almost 1,600 banks. The competition, including against state-backed lenders, has put pressure on its margins. 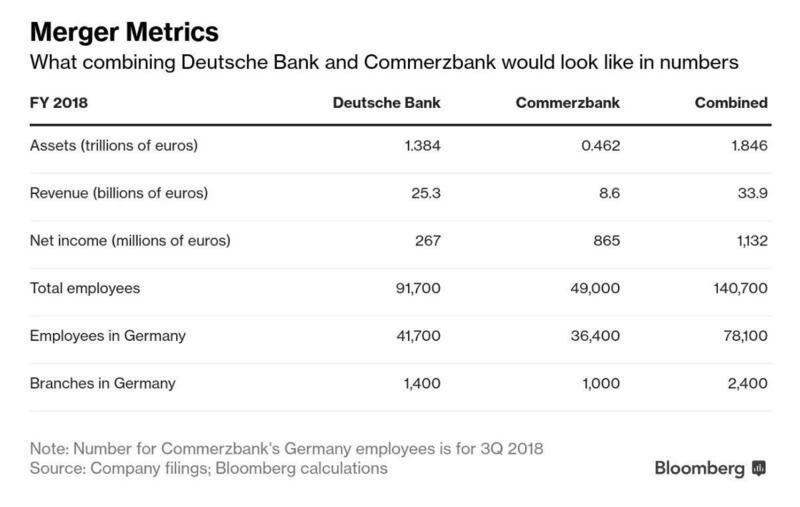 As the Journal adds, DB executives suggested a combined Commerz-Deutsche Bank would benefit from lower funding costs, using a bigger pool of retail deposits to its advantage. Whether that will be sufficient to offset the exodus of the bank's top bankers who have been denied bonus increases for two years, remains to be seen. So what would a combined bank look like? 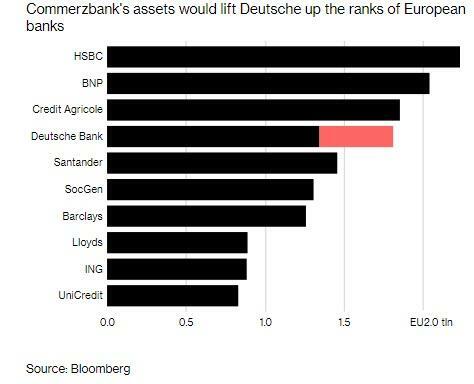 As the following Bloomberg charts demonstrate, the resulting bank would be Europe's 4th largest, behind HSBC, BNP and Credit Agricole. Some more good news: after years of declining revenue, the combined company would at least return to where DB was in 2015. Alas, the trend will still be lower. Unfortunately for shareholders, despite the revenue boost, costs will likely remain largely flat with little contribution from massive synergies as both banks have already laid of thousands. Finally, and perhaps most disappointing for the combined banks, while a deal would leave only one German bank with global reach, the combined firm wouldn’t be dominant at home. 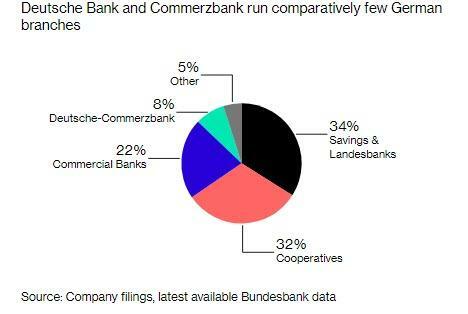 A merged Deutsche-Commerzbank would control less than 10% of German bank branches and would still face competition from savings and cooperative lenders according to Bloomberg. Those firms aren’t under the same pressure to generate profits and they have ruled the market for retail banking. Meanwhile, the real reason behind the slump in the German bank's profit, the ECB's NIRP policies, will continue for the foreseeable future.